This was a recent custom plaque request that was so meaningful to us that we have decided to make it a part of our regular offerings! When things in your lives seem almost too much to handle, when 24 hours in a day are not enough, remember the mayonnaise jar and the 2 cups of coffee. The professor next picked up a box of sand and poured it into the jar. Of course, the sand filled up everything else. He asked once more if the jar was full. 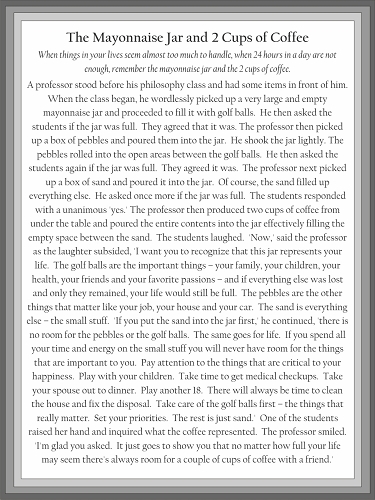 The professor then produced two cups of coffee from under the table and poured the entire contents into the jar effectively filling the empty space between the sand. The students laughed. 'Now,' said the professor as the laughter subsided, 'I want you to recognize that this jar represents your life. The golf balls are the important things--your family, your children, your health, your friends and your favorite passions---and if everything else was lost and only they remained, your life would still be full. The sand is everything else---the small stuff. 'If you put the sand into the jar first,' he continued, 'there is no room for the pebbles or the golf balls. The same goes for life. If you spend all your time and energy on the small stuff you will never have room for the things that are important to you. Other plaque sizes are readily available. Custom plaques are our specialty! Please call with your requests. WoodenUrecover.com is not affiliated with nor are any of these pages endorsed by Alcoholics Anonymous World Services, Inc. or any other 12 step program. WoodenUrecover.com is, however, owned and maintained by members of the fellowship in NC. Copyright WoodenUrecover. All Rights Reserved. eCommerce software powered by 3DCart.